Bring out the Halloween spirits with this easy DIY hanging ghost decoration. Make a crowd of glowing ghouls and it will be a haunting to remember. 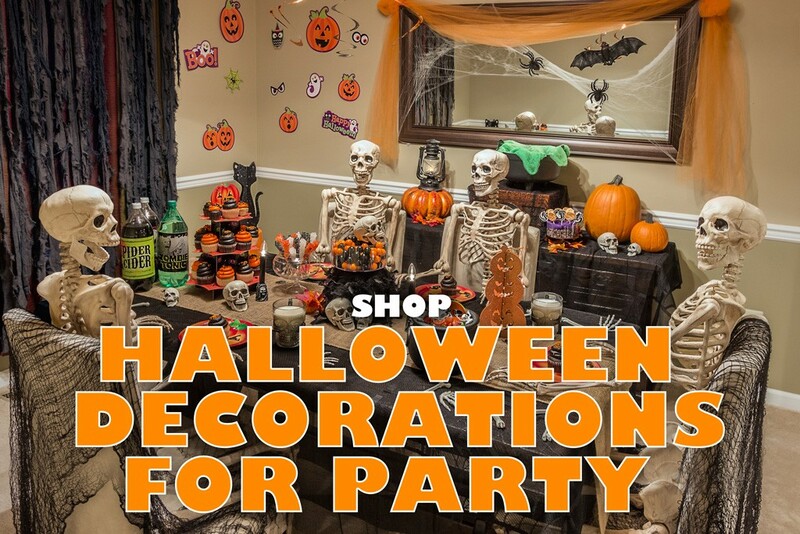 We broke it down step by step for you, so grab your supplies and get ready to spook the neighborhood! Step 1. 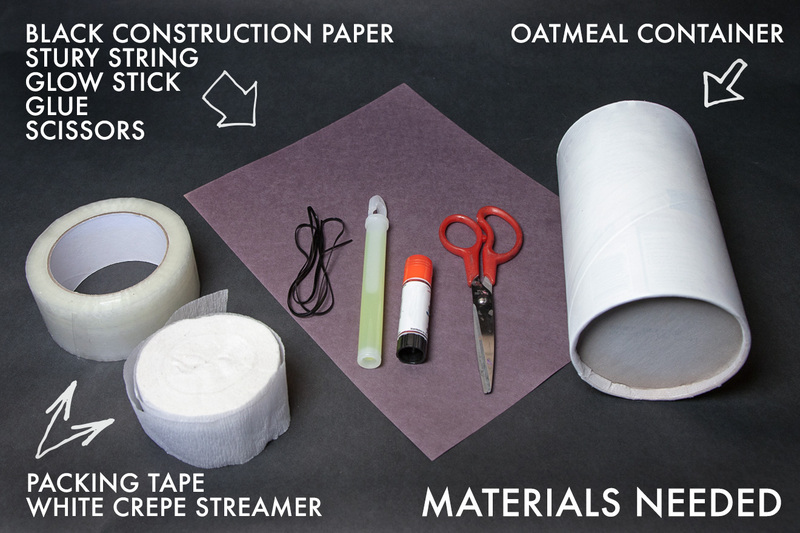 Start by measuring and cutting the crepe paper for use in a future step. Drape the crepe paper over the top of the container and let it hang down about 3-4 inches on either side. Step 2. Cut more pieces the same size, approximately enough to cover your container. I used a small oatmeal container, you might need more pieces if you are using a larger container. Step 5. WRAPPING YOUR CONTAINER- Always start with the sticky side of the tape facing out, otherwise the tape will stick to the container and will be harder to remove. Hold the end of the tape in place with one hand, while wrapping the tape around the container with the other hand. Overlap the tape, so that it sticks to itself. This will make it easier to wrap the whole container. Step 6. Finish wrapping to the end of the container. 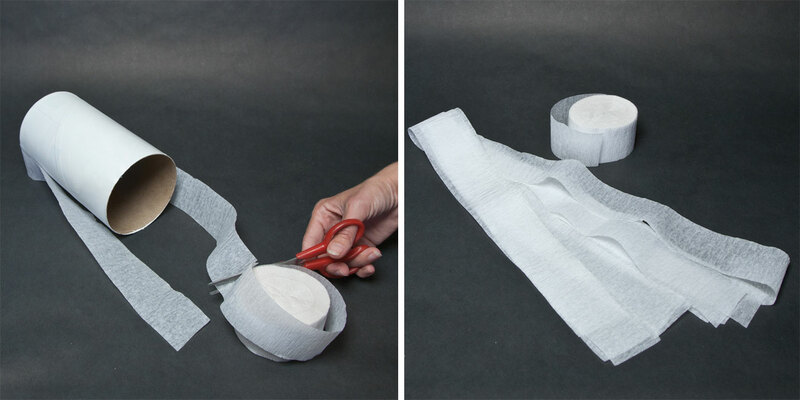 You can wrap using tape straight from the roll, or cut and wrap smaller pieces, whichever is easier. Step 7. Turn the container over and wrap tape across the bottom of the container, make sure to keep the sticky side facing up. Step 8. Once finished, cut the tape. Step 10. Gently stick your scissors under the edge of the tape and cut the tape apart, as shown. Step 11. Pull the taped-up shape off the container. Step 12. Tape closed, the cut seam. For this project, keep the stick side of the tape facing out. Step 13. Place your shape with the bottom facing up, and drape with a precut piece of white crepe paper. Press to hold firmly in place on the sticky tape. Step 14. Repeat step 12 with the rest of the crepe paper pieces. It’s fine if the pieces are slightly uneven. Step 15. When complete, your piece should now resemble a ghost. Step 16. Cut and glue a face to the ghost. To use the face shown, download the printable and trace onto the black construction paper. Step 17. Using the scissor, cut a small hole in the top of the ghost. Step 18. 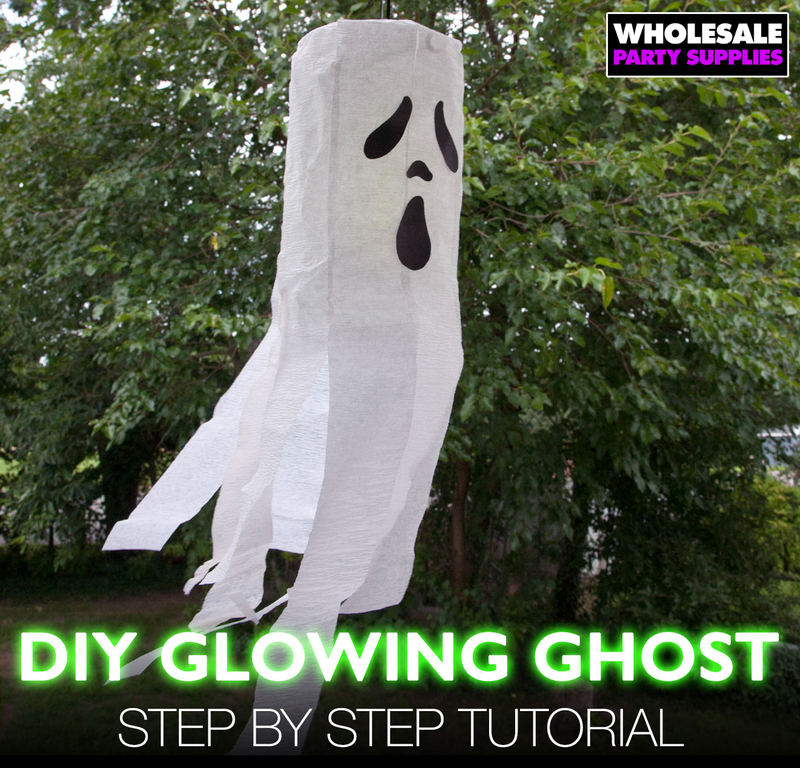 Attach a glow stick to a string and thread it through the hole in the ghost. Step 19. Tie a knot in the string. You can easily change the glowsticks when they are used or to switch colors. Your Ghost is ready to hang, inside or out! 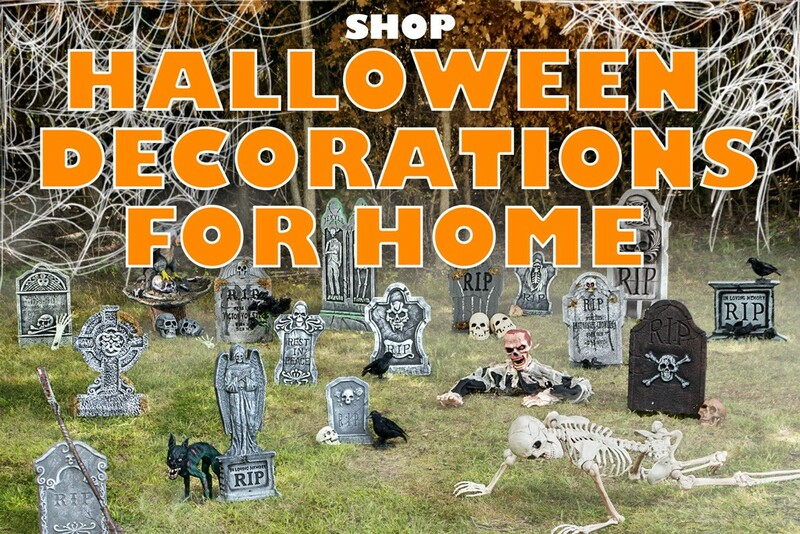 And if you don’t want to DIY all of your Halloween decorations, we’ve got werewolves, webs, witches and more in stock here. For all the crafters out there, here’s a cheat sheet for your Pinterest boards.